You can already easily insert YouTube videos and Google Gadgets into your wiki using the Plugin menu (click Edit >> Insert plugin). Any other widget with embeddable code! 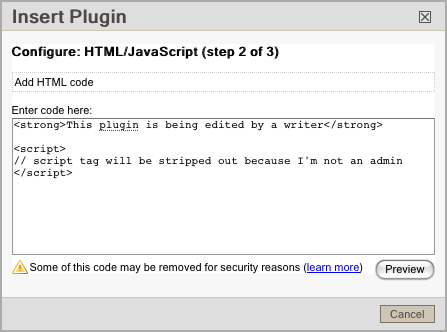 Widgets can sometimes result in unexpected behavior, so we’ve included built-in security for this feature (learn more about PBwiki security). 1. Go into edit mode on your wiki by clicking the “Edit” tab. 7. Click “Preview,” then “OK,” and now “Save” your wiki page. Looks like the New Features category is getting a bit neglected. 😦 I spy quite a few posts about new features in the last couple of months that didn’t make it into that category. That’s especially important because the “new features” email that was sent out today links to the category page, in which the most recent post is from Sept.
Oh, yippie-ki-YAY! This is great… thanks for bringing back this functionality! I’ve missed it. Can anyone get their flickr slide shows to run on PBworks? I am administrator for this wiki. 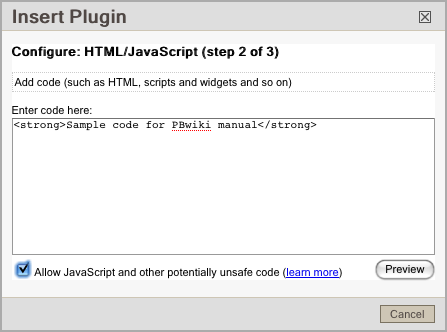 Is there some setting that I haven’t found to enable the use of a HTML/Scripts plugin? The best way to get help is to contact our support team. Click on the ‘help’ link located at the top right of your workspace. I will send this question to our team, and someone will contact you soon.